You are here: Home / Administration / The best gifts for volunteers chairing an auction are … flowers?!? Here’s an idea from one of my school clients. 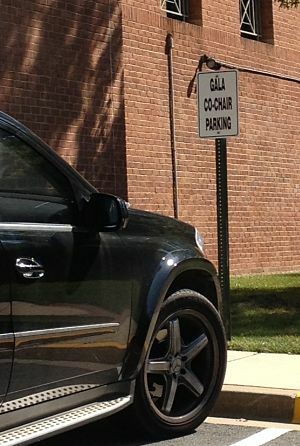 The administration says “thank you” to its Auction Chairs by providing her and her co-chair with their own parking spaces. A few years ago I conducted a study among my clients. I asked a portion of my Auction Chairs how many hours she spent planning her auction. I wasn’t interested in the total hours of the committee. I only wanted to know her hours. In the final count, a mix of schools and nonprofits submitted their totals. The survey also had a smattering of large and small galas. After compiling the results, the results revealed that the average time spent was a shocking 1,000 hours. In the “real world” that translates to six months of full-time work. Wow! For someone who is devoting as much time as that to planning your auction, shouldn’t we reward her with perks to thank her? I think there needs to be a few more benefits with this job. Sure, it’s a nice gesture to present her with a floral bouquet on the night of the gala (when it comes to gifts for volunteers, flowers are the most popular), but that seems underwhelming when one considers the effort put into the role. Chairing an auction is a big, BIG job. 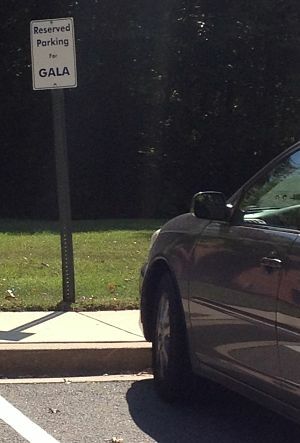 One perk might be to give her a designated parking space at your school or nonprofit. A convenient place to stash her car (or motorcycle, or truck, or Segway, or whatever … I’m not judging) will help make her visit more productive. For an example of this, look at these photos. One of my school auction clients prominently displays these signs in front of the building where much of the auction work takes place all year. And here’s another reason signage is a great idea for you. It increases the visibility of your gala within your community. When you post a permanent sign, it’s seen by other volunteers … your staff … your clients. Everyone is reminded about your auction gala. “This auction gala is SO important,” you’re conveying, “it comes with its own parking space!” Awareness about your event improves. Not every organization will be able to provide this perk, but for those who can, it’s a nice touch. What other gestures can we offer to our Auction Chair to show her how much we appreciate her time and energy? If you’ve got some ideas, mention them below. Here is a thought that provides more enduring recognition while not diluting or dipping into the money earned by the auction. Pick a specific part of the recipient organization, and make a donation from the auction in the name of the chair. As an example, for an event where the beneficiary is a children’s hospital, spending will usually be discretionary, but through discussion with the CEO identify a specific area of need, such as a playroom or updating an area where signage would be appropriate, and make a donation of 5% of the proceeds in the name of the chair, with her/his role clearly identified. The most significant reward in life for most of us is validation, and our prime motivator. That is precisely what recognition achieves. Great suggestion, Don. I can see as where this would work for a number of groups. Thanks for sharing!